With more than 700 million users, it’s no wonder that Instagram is an integral part of any social media marketing campaign. Brands need to make sure they are using it right for their target audience by avoiding any careless blunders. If you are already baffled by the idea of filters, hashtags, captions and followers or simply looking for some amazing ways to improve your online brand existence. Here is a list of some common Instagram marketing mistakes that your social media marketing team should avoid in order to strengthen your marketing efforts. There are many brands who are constantly looking for ways to build a strong Instagram presence, and purchasing followers in order to stay on top won’t do you any favors in the end. Though your account gained thousands of followers instantly, but chances are, the posted content won’t get any likes or comments. The followers you buy are mostly teenagers who don’t have any interest in your brand or bots that share totally irrelevant content. And these are not exactly the type of people you want your brand associated with. Instead of buying Instagram followers, businesses need to create a strategic approach, create an effective Instagram marketing campaign, share engaging, valuable content and interact with audience. Okay, you have created an account, gained sufficient followers and regularly posting informative, interesting content. To get the most out of Instagram, you need to pay careful attention to the numbers, which most social media managers usually ignore. With trial and error, you will be able to determine the posting schedule, types of content, hashtags, post captions to get the best responses and more engagement. The best way to measure these insights is to use the Instagram’s feature of “Instagram Insights” that helps you know who your followers are, when they actively present online. You can also see insights for a particular post and story you have shared to check the performance of your content and how people are responding to your posts and Instagram stories. Though numbers and statistics are not the only means to measure your Instagram success, they can surely help you provide with a clear sign of progress and what strategies work best. Constantly promoting your brand in your every single post on Instagram is a definite way to alienate your followers. If every time you post on Instagram are images of your own product, your band logo everywhere, or information about your brand, your followers are going to lose interest in your brand. Think differently, come up with a strategic approach. Try to convey the values of your brand and products with the help of engaging content. 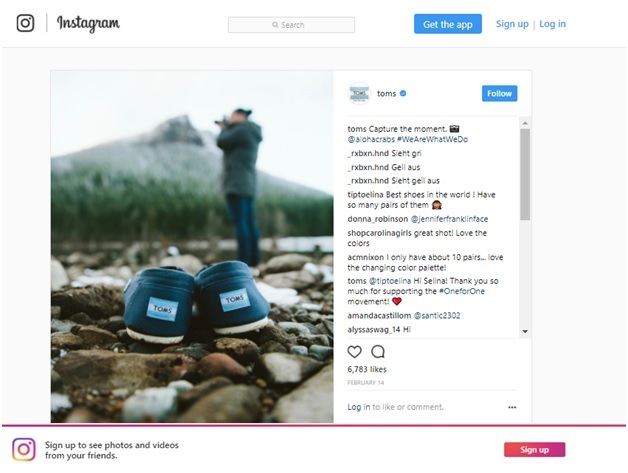 For example, Toms Shoes, has curated an Instagram account that features the images of their products, lifestyle content and their communities. This builds a clear visual representation of their brand and convey their One for One brand message in the real world. If your brand really wants to drive more engagement and increase conversions, you simply can’t afford to create senseless Instagram captions. Interesting Instagram captions not only give a clear context to your posts, but can generate emotional responses from your followers. Use the most important words in the beginning of the caption. Use emojis and add a fun element to your caption. Ask thoughtful questions to encourage audience to participate. A study suggests that almost 91% of Instagram posts contains between one and seven hashtags. It clearly suggests that hashtags have more value and a convincing tool. But there are some digital marketers who are misusing this powerful tool. Brands misuse hashtags in different forms, such as overuse hashtags, underuse hashtags or use irrelevant hashtags. Basically, the purpose of using hashtags is to allow audience to discover other topics – if you are spamming your posts with irrelevant or too many hashtags, you are actually devaluing your brand credibility. And if you have quality, engaging content but not using any hashtag at all, then you are simply missing out on a huge opportunity of being discoverable and getting more engagement. Read this simple guide on how to use hashtags. Editing your Instagram content can increase your chances of getting more engagement by 45%. If you are overlooking this important Instagram marketing strategy, you are missing out on an opportunity to drive interactions. There are countless editing apps available that can help you avoid posting lackluster images on your Instagram account. You can improve the quality of your photos and videos by using some effective Instagram Apps and take your marketing to a whole new level. “Set it and forget it” approach doesn’t fit for Instagram at all. It is important to create relationships and build meaningful connections. Build relationships, take part in conversations and respond to your community comments and questions. 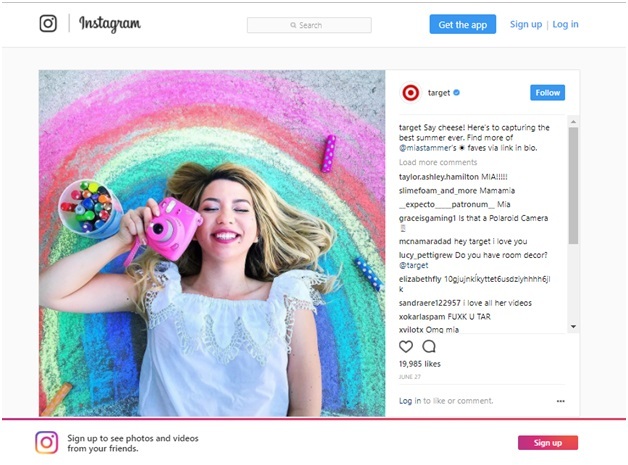 Instagram ad feature to connect with your target customers who are willing to hear what you have to convey. There are four types of Instagram ads that you can use to give your content a significant boost. that disappear after 24 hours. It is estimated that more than 200 million users share Instagram Stories daily and one in five Stories get a direct response from a user. If your brand also wants this instant and direct interaction with your audience, use this feature smartly. Keep these points in mind while creating Instagram Stories. Tell an interesting story, a step-by-step guide, a tour to your office, or anything interesting. Show the true personality and values of your brand. Keep your stories real. Offer immense value, keep your content authentic. Make your stories more interesting by using Instagram Stories features such as stickers, filters, tags and more. If done right, Instagram serves as a remarkable tool to convey your brand’s value to the whole world. By avoiding these Instagram mistakes, you can simply pave your way to success.